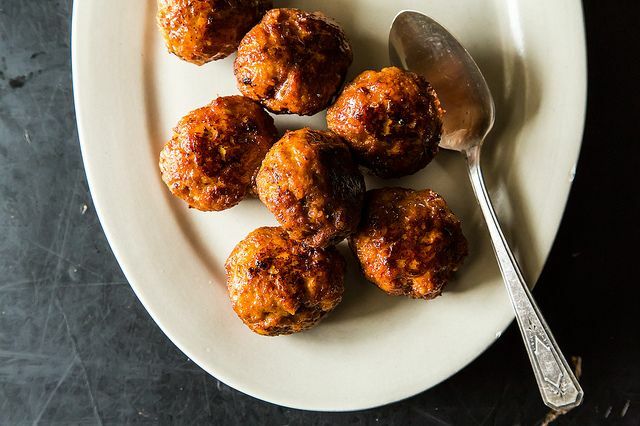 Today: If you can source good ground meat, you can make meatballs. Jennifer Steinhauer (a.k.a. Jenny) teaches us their ways. Meatballs are by definition not a recipe kind of food. 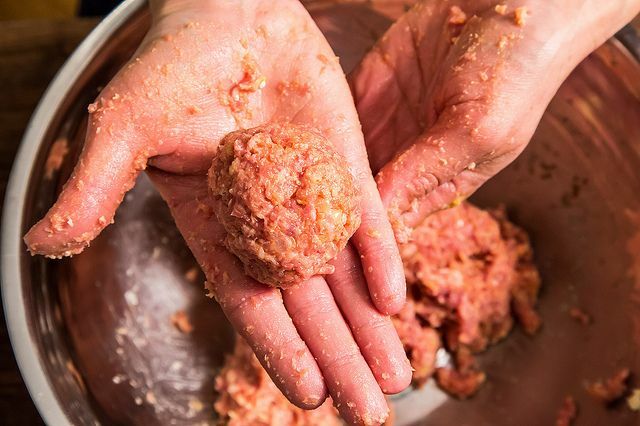 You need some meat -- about a pound of it -- and you will make them into balls. They need something to bind them (that is where eggs and breadcrumbs come in), and some seasoning and flavor, especially if you are using poultry meat as I tend to. I like to dump a lot of cheese in mine for extra yum. While traditionally I fry these mamas, of late I have been cooking them in sauce, which is far less mess and really flavorful in a different way. You can also bake them but that never yields great results for moi. 1. 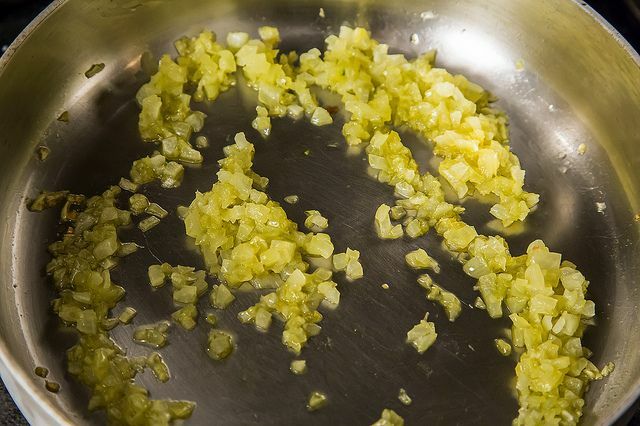 Get a small onion or some shallots cooking in oil. 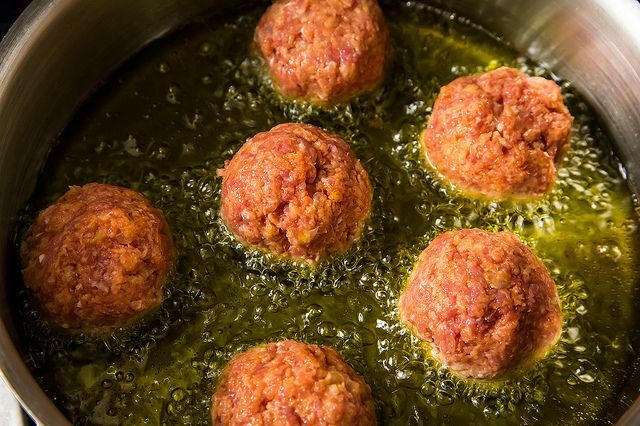 Once they've softened, let them cool -- they'll be going in your meatballs. 2. In a large bowl, mix up about a pound of dark turkey meat, or pork, or beef (Did I say lean? No, I didn't!) 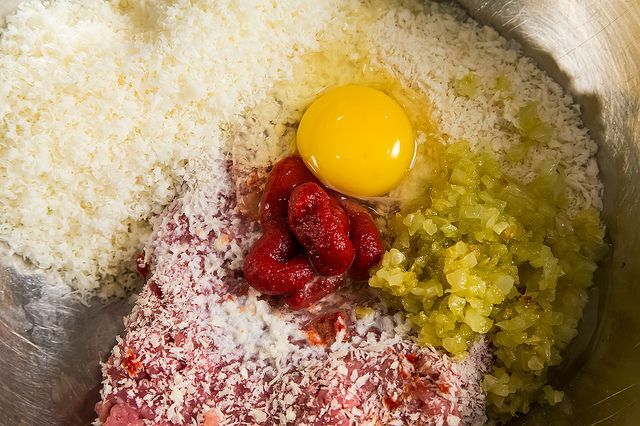 with your cooled onions, a spoonful of tomato paste, a cup of any salty cheese like pecorino, a cup of breadcrumbs (I use panko), a bit of milk, and an egg. If it feels too wet, add more breadcrumbs and/or cheese. I love a ton of cheese, to be candid. If you have some parsley or oregano and people who don't balk at green in their meatballs, you may chop a bit up and add it. 3. Make balls in your hand about the size of two golf balls into one. Please keep them uniform so they cook evenly. 4. Refill your frying pan with a enough oil to cover the balls halfway. Get it going till shimmering. (Alternately, you can simmer the balls in your sauce.) Put up some pasta water. Add the balls one at a time. Do not crowd them. You may well have to do this in batches. 5. Nudge them around the pan with a spatula from time to time. The key here is to keep them from burning, but also to cook them all the way through. You will end up with some that are more crispy than others but just try to control the heat. Pick a sentinel meatball to test for doneness. This should take about ten minutes. Now cook some pasta, while you remove your balls to drain on a paper towel-lined plate. Serve with pasta and red sauce or plain butter and cheese and black pepper. I sauté a mirepoix mixture first with fresh garlic, then add in breadcrumbs etc. BTW - for my meatball recipe, I puree a a raw onion in the food processor and add it to the meat. It's much faster than cooking and cooling onion. It gives onion flavor without onion bits (which the kids appreciate). And it adds a lot of moisture. I also prefer to make fresh bread crumbs - pretty easy in the mini food processor and a good way to use up old bread. Not using lean meat ... Not including a teaspoon of salt per pound of meat ... And frying meatballs in deep fried fat ????? Sorry, but this is the worst meatball advice EVER. How long do these puppies need to braise? Instead of breadcrumbs I usually use bran or oats and add some finely grated carrot to add some moisture and extra flavour. Also as some family members don't enjoy tomato sauce, meatballs are cooked in a grated carrot, bell peppers and onion sauce. This looks great and just about how I make mine. I do use ketchup or you can use tomato paste with a spoonful of vinegar. The vinegar makes the meatballs nice and tender. I like using ketchup because it gives the meatballs a little sweetness and other flavors I don't need to add independently. I know some of you may be horrified but they are delicious. Also try adding some seltzer making sure not to bust the bubbles. This makes your meatballs nice and fluffly. I have used cola or Dr. Pepper in the past and they are delicious too, even the diet. Thanks for this alternate method Jenny! Great article, as always, Jen! I bake mine on a cookie sheet at 375, turning once or twice for even browning. Two things I swear by are: (1) meatloaf mix - the combination of beef, veal and pork makes for a very tender, flavorful meatball and (2) I use the Rao's trick of slowly adding a cup or so of lukewarm water to the mix. At first, the water/meat mixture looks kind of gross and very loose, but the panko/breadcrumbs soak up the water and you end up with the most delicious, delicately-textured-yet-hearty meatballs EVER! My mother always fried meatballs like this, but I've found that I prefer to bake them on a cookie sheet. It works wonderfully well, they get nice and brown, and the cleanup is much easier. They don't spread out like cookies do, so you can do a lot on one sheet. Also might save a few calories, though that doesn't motivate me. Ditto on the baking sheet. The calorie savings is a nice plus, but I also find it to be more efficient time wise. I like to freeze the cooked ones too, for throwing into soup or a sauce for later. 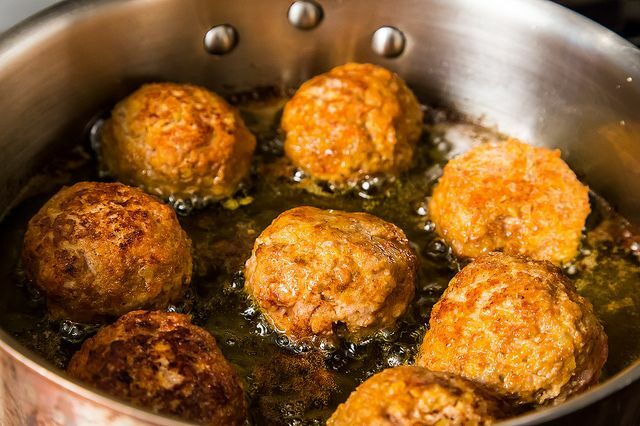 I always simmer my meatballs in sauce, but I am super excited to try the frying technique for a treat/change one night soon.